The holiday season is fast approaching and no doubt invites have started arriving from those organized people who have already got their functions sorted. If you have left things a bit late and starting to panic about venues – you don’t have to worry. Party Bus has got you covered with the answer to your end of year party stress. If you want to make sure your party is a success, and one that is remembered, host it on one of our fabulous chauffeur driven buses. Our “parties on wheels” take care of and cover everything you could ever want for your function. By hosting your party with Party Bus, you cut out all the hassles of transport to and from the function. This is especially helpful when your guests want to let their hair down and enjoy a few drinks. There is no worry of drink driving or how to get home, as our bus can drop your guests back to where they started. Another option is to have them some dropped off in town to keep enjoying the night. Whatever you choose you will have zero transport hassles. There is no reason to worry about the size of your party either. Our buses are incredibly roomy and can accommodate you and your guests while still leaving room for trying out those new dance moves. Or if you would like to book a last minute event venue, we still have some space on Friday 13th December 2013. Call me on 09 417 0030 for a deal on this day at our Boogie Nights venue. Entertainment whilst on board is completely covered, with state of the art technology. You can set the mood with black lights, and then get the party really going with the strobe light. The flat screen TVs will be set up with the latest music and videos. 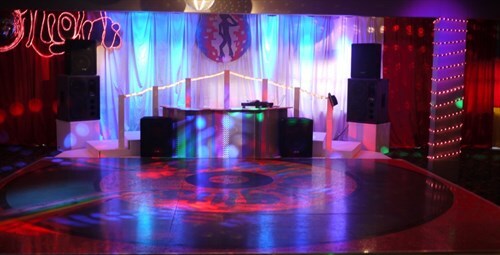 And along with our second to none sound system, there is no excuse for your guests not to enjoy themselves, (they can even bring their own music!). All you need to do is arrive, sit back and enjoy yourselves. Your bus for the night will have a well stocked bar, offering other refreshments and food. Truly hassle free hosting. If you’re a bit of a foodie as well as a partier, another option is to stop at your favourite restaurant. The party bus will drop you off, and once you have finished dining pick you up again, and you can resume the festivities on-board. (Don’t be surprised if any fellow diners want to climb aboard as well). To make the night truly yours and unique you can even arrange to have the bus decorated how you want it. Choose colours and decorations that will combine to give your guests a party they won’t forget. From the moment you arrive onboard the bus, it’s fun, fun, fun. You will have your own professional and experienced chauffeur who will drive you and your guests around and make sure you all have the best party ever…. As the host you are free to drink and enjoy yourself with your guests. Once the night is over there is no need to worry about your guests getting home safely as they will be delivered back home or to their collection point. The Party Bus crew are incredibly experienced in their field and if there’s on thing they know about – it’s how to throw a party.